Confronting art techniques for oil painting for the first time may overwhelm the beginner on the diversity on offer. Fine art painting books would suggest that oil painting requires complex practices and materials, but this is not necessarily the case. The beginner may enjoy simple oil painting techniques with effective results, and which will give the fledgling artist satisfaction. The beginner in oil painting may begin with all prima, which simply describes a painting completed in one session and therefore in one paint layer. Quick oil painting sketches of landscapes or skies, for example, are typically completed in alla prima. Such a technique requires the application of neat oil paint straight onto the painting surface. Oil painting impasto complements alla prima, in that impasto describes a thick paint layer, and one which may enhance the painting with brisk brush marks or other textures within the paint. Thick paint or impasto can be manipulated with wide bristle brushes, palette knives or other mark making instruments. In opposition to the two oil painting techniques just described, glazing with oils describes the completion of a oil painting by the application of several layers of oil paint and over several sessions. Each layer or “glaze” will be translucent in appearance in order to modify the colour beneath, to enrich the colour or to alter its tone. The paint will usually be thinned with either linseed oil or an alkyd medium such as Liquin. Many old masters practiced glazing, applying in as much of ten or more before satisfied with the result. My Youtube clip below, showing Bacchus from Titian's painting Bacchus and Ariadne, shows the combination of 2 art techniques: the background had been completed in glazes for smooth detail. The Bacchus figure, as can be seen, was completed in one paint layer (alla prima). Sgraffito provides special paint effects by adding textures to the oil paint. Any mark making implement can be used, from old combs and toothbrushes to pencils. By applying a conflicting colour beneath the painting, this colour will be revealed when the upper layer is etched off, introducing an element of movement and energy to the oil painting. Further techniques in oil paint can be explored as the artist learns more about this medium. Tonking is a useful technique for undoing an area of painting the artist is unhappy with. By blotting off the area concerned with newspaper, the paint can be lifted off without affecting the surrounding area. Scumbling is an oil painting technique that gives a broken finish to the paint, adding atmosphere to clouds or landscapes. Constable practiced scumbling in his later paintings. 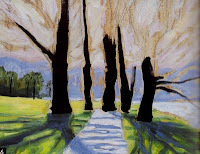 With different oil painting techniques at one’s disposal, the artist can make oil painting as simple or as complex as one needs it to be. Several techniques can be combined within one painting to provide contrast in approach. But the beginner need only require the oil paint, a few brushes and primed artboard in order to begin oil painting. Because the colour of snow is inherently white, this knowledge will be carried into snow paintings, resulting in a flat portrayal of snow. The beginner in painting snow will stick to pale colours, or just white, creating a painting that appears unfinished for the white patches that abound. Some artists make the mistake of darkening the colour of snow with black, resulting in dirty looking snow that lacks atmosphere. Similarly, snow often contains subtle darks, from deep violets, midnight blues and earth colours, to magenta. Applying a thin wash of a neutral coloured paint over the painting surface prior to embarking the snow painting will help the artist judge the true tonal values of snow. This would be impossible if the white colour of snow were applied onto a white painting surface, which would give a misleading impression of its tone. Acrylic paint is ideal for underpainting, for it dries quickly and provides a good grounding for oil paint. 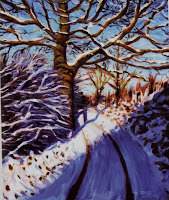 See my youtube clip on painting a snowy landscape in 7 steps. For subtle colours and detail, such as the dusting of snow on branches, good quality thin sables should be used. To suggest snow blasted surfaces after a blizzard, a little white paint can be flicked at selected areas of the painting. A fine spray can be achieved by mixing a little linseed oil into the paint mixture. Lastly, when darkening the colour of snow, it is best to introduce the dark colour gradually, to prevent a dirty mix or producing shadows that appear too black. The following pigments would come in very useful for adding depth to snow paintings: white, ultramarine, pthalo blue, burnt sienna, permanent rose and burnt umber. Other colours will occasionally be seen, such as a little cadmium red and even viridian. Impasto medium is useful for impasto techniques, as well as good quality wide bristle brushes. Sables are invaluable for blending and detail. Round sizes 3, 6 and 12 would suit most painting sizes. The beginner in oil painting may try to make a sky sketch more interesting by filling it with idealistic puffy white clouds. 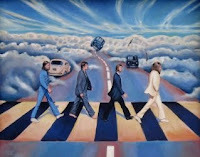 Such a cumulus painting is likely to be expressed with white paint upon a stark blue sky. The contours of the clouds will have a bubbly or candyfloss look. A painting of cumulus clouds of this nature could spoil an otherwise accomplished landscape painting. Close observation will reveal that there is more to cumulus clouds than mere puffy cotton wool formations. Cumulus clouds have different categories and shapes, for instance, Cumulus Humilis are the regimented flat-based formations often seen during settled weather; cumulus Congestus are formed from stronger convection, creating taller formations and sharp outlines. Cumulonimbus Incus is a wedge-shaped thunder cloud with a dazzling array of tones and colours. The following observations will help the artist paint cumulus clouds to add atmosphere to the oil painting. Looking for unlikely colours will result in more convincing portrayal of cumulus clouds. They often contain violets, greens and crimsons, as well as pinks. Bizarre colours can be seen reflecting off cumulus clouds during the oblique lighting of sunrise or sunset, such as dazzling red, yellows and greens. Resist the temptation to tone them down. The following colour palette is invaluable for painting cumulus clouds, although other colours will be seen: Titanium white, burnt sienna, burnt umber, ultramarine, pthalo blue and permanent rose. Round bristle brushes (not flat) are ideal for impasto effects or for applying large areas of colour. Good quality sable brushes are ideal for blending, but fine sables, sizes 3 and 6 are good for detail, such as defining the sharp edges of a thundercloud. Impasto medium will add bulk to the oil paint, adding texture to an impasto sky painting. An otherwise effective oil painting could be spoiled by a garish tree, a black splodge or a grey expanse of water that is not in keeping with the vibrant colours of the painting. In an attempt to put the painting right, the artist may fiddle with the area, overworking the paint until it looks a muddy mess. How can the painting be put right? If the area is quite large, such as a lake painting or area of sky, for example, carefully wipe the paint off with a clean soft rag. Keep wiping the area with a clean area of cloth until most of the paint is removed. If the offending area of the oil painting has completely dried, the area can be lightly sanded down with fine glass paper to remove any impasto effects and paint ridges until smooth. Using a dust buster or vacuum will prevent the dust from lodging into another area of the painting. If the offending area is close to an intricate area of detail, the artist may use a method known as “tonking,” named after sir Arthur Tonks, who came up with the idea. It is quite simple and is akin to blotting. When tired or time is running short, don’t rush it, put the painting away. It can be completed the next day. How do I Make Water Look Like Water in My Paintings? 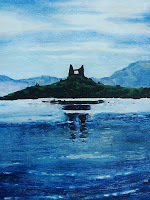 Painting reflections in water paintings is often a most problematic area for the beginner. They are often illustrated as simply an inverted image of the object above, sometimes misaligned or too idealistic. In other cases, water is illustrated as an area of harsh blue or slate grey, with suggestions of little waves on top. Such a portrayal of water is likely to look naive to the viewer. By drawing attention to painting practices that are the causes of an unsatisfactory painting of water, the artist can begin to make improvements. The following areas are often the culprit of a lake painting that fails to convince. Although water is a complex subject matter, when it comes to painting lakes, seas and rivers, water adheres to certain rules. Ripples, waves and other surface textures on the water will appear smaller, flatter and more regimented with distance. The colour of the sky will always appear a little darker and saturated when in reflection. See my video clip on how I painted water in this Lakeland scene. As can be seen, the colours of the lake adhere to certain rules. The colour is deeper than the sky colour, patterns appear more regimented and smaller with distance. A basic colour palette of cerulean blue, burnt sienna and white was used. When painting reflections, turn the painting upside down to ensure they are truly vertical and lie immediately below the objects reflected. Don’t exclude any colour from the palette of water, regardless of how bizarre it may seem, so long as the colour can be perceived in the water. Resist the temptation of illustrating every wave and ripple. Using a soft brush or wide bristle brush will help soften any sharp edges and lines. If the area of water is unsatisfactory, it pays to wipe the area off with a clean rag, or to let the area dry and to apply a thin layer of oil paint on top in a glaze. Painting water favours some colours more than others. Useful pigments are titanium white, ultramarine, pthalo blue, cerulean, permanent rose and viridian green, although other colours will be seen. Good quality soft sables, flat sized 6 and 10 are useful for blending large areas of water. Rounds sizes 1 and 3 are ideal for sharpening up detail. Bristle brushes such as ox hair are perfect for impasto techniques and pasting on large areas. For experimental techniques, linseed oil will add transparency and lustre to the paint for glazing techniques. Impasto medium is ideal for adding body to the paint and making the painting stand out in relief, for example when expressing rough seas and spray.